SUMMER AND WINTER VACATION RIGHT ON NANTASKET BEACH!!! The perfect spot for a beach vacation! Charming cottage right on Nantasket Beach. Find the sand down the stairs from your own deck, no street to cross. You can spend your time in beautiful water, kayaking, swimming, fishing, surfing (great surfing location) etc… or you can sunbathe, read and surf the internet on your deck. It is all happening around you: ocean, beach, grilling, restaurants and shopping within 5 minutes walking. Ice-cream, the historic carousel and the miniature-golf are a pleasant 7 minutes walk on the beach. Spend your day in the quiet of your home, then have a grill at the beach and finally end the day with a walk to your favorite ice-cream place. 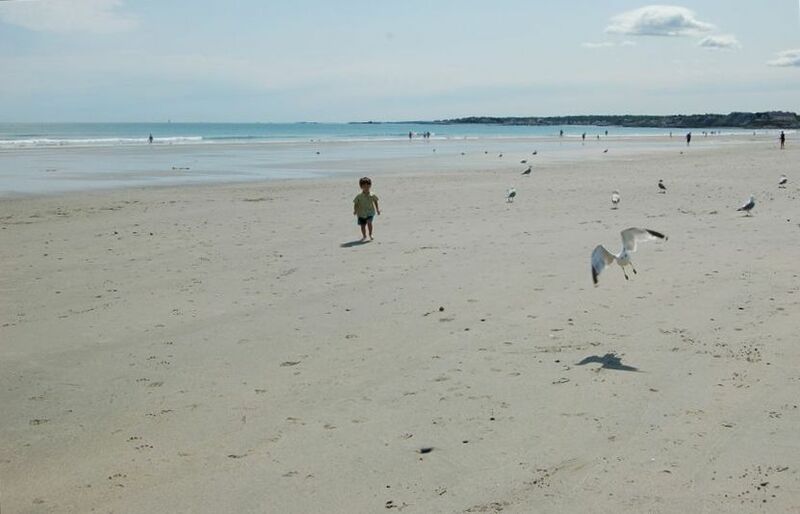 The beach is 6 miles of beautiful sand, with the Boston lights visible on the north side and the Minot light on the south; the sand is great for walking and running. The house is a charming cottage from the early 1900's with a lot of character. It has been just recently renovated in its kitchen, bathrooms and hardwood floors. The cottage has a large master bedroom on the second floor, with a full bathroom and a sliding door on the deck, viewing the ocean and the lighthouses. The other two bedrooms are also on the second floor and have partial views of the ocean (they have full beds). The first floor is open, with a large kitchen with dining area and living room. The living room has two couches and other chairs and a large flat screen TV. This large room has two large windows with stunning views of the ocean and the beach. The door from the living room opens directly to the deck on the beach. This is a large covered porch with a dining and sitting area right on the beach. The half bathroom is also on the first floor. Because of parking being an issue in Hull, it is important for you to know that the house has 2 off street parking spaces. Wi-Fi has a fast and strong signal in the house and outside. Washer and dryer are available to you in the basement. This is one of the few houses directly on Nantasket Beach. No road to cross. This house has a great location in Hull. It is right on the beach and convenient to everything in Hull. It is also easy to get out of Hull if you want to go see what else the area has to offer. The house is well laid out and, although we barely cooked, had all that we needed in the kitchen. There are 1 and 1/2 baths. The only full bath is in the master bedroom which took a little coordinating but worked. It has been redone and is nice. The house itself is older but clean and cozy. The owner of the property was accessible by email and answered all my questions promptly. We had a small issue with tv and WiFi upon arrival and it was handled immediately. We would definately stay here again! This house is cozy but its old. The paint blazes off the windows which has a certain charm. The house is very clean. Good working internet. Great location. But .... You can not close the entrance and patio doors without making a noise. Very bad if someone else sleeps. Windows: Rain is coming in even the windows are closed. The door to the master bedroom can't be closed, the curtain is broken. The mattresses in the 2 rooms are very firm and super uncomfortable. The master bedroom mattress is firm too but at least a memory foam mattress. The windows rattle when it's windy, don't close probably. The kitchen table vibrates when the heater is working. It is an old house that needs to some work. For this price tag, even with this great location, just 2-3 stars. I am sorry that the weather was not more clement with these guests. The winds during their stay got to be above 35 knots. The cottage is right on the beach and it is exposed to the East. The big windows on the beach have hurricane shutters for these weather events. I ask our guests to use them or call me and I can explain how to operate them; otherwise rain driven by the wind will come in. I would like to point out that the memory-foam mattress in the master-bedroom is TEMPURPEDIC. Some guests find the stormy weather to be part of the thrill, others find that storms make it a challenge to enjoy their stay. In bad weather at the ocean, windows do rattle. Owner is renting weekly against town ordinance. We were greeted on several occasions on the back porch by the owner telling us to be quiet. 6 adults in their 50s listening to a Red Sox game on the radio and enjoying a glass of wine. Well, we were chased out of our rental. The place we paid for, the view of the ocean. I would not rent from this owner. She was more concerned about being reported to the town for renting her property illegally. Unprofessional to say the least. VRBO should have a requirement to prove that this kind of rental is allowed before accepting listings. As a VRBO owner myself I was shocked! This house has a unique location directly on the beach, and provides a wonderful setting for enjoying the sunrise, long walks on the sand, and swimming in the ocean. Because of the location, it is important to maintain the environment for other visitors and neighbors who also want to enjoy the beach and the views. Guests agree up front to bring no more than 3 regular size cars, and no parties are allowed. These conditions are clear to everyone from the start. Fortunately, most guests respect these, and they have enjoyed the location very much. From time to time, unfortunately, there are some who are disruptive and are not able to maintain the calm atmosphere of this location. This is not the right spot for those who plan for large groups, loud parties, outside drinking, or tightly packing cars and trucks in the driveway. Such conduct is not tolerated, as is clearly specified during preliminary communication. Perfect cottage on the beach! We arrived to the ocean waves crashing on the sand literally in the backyard and the smell of the salt water. We were greeted by our lovely hostess on arrival, and she walked us through the entire home. It was beyond our dreams to be able to wake to the ocean every morning and look out the picture windows at the Atlantic each day. Our own beach spot was just beyond the back deck and we put it to very good use! Grilling dinner on the almost new grill was excellent at night, and we cooked breakfast each morning on the new stove. We had a date night, with full confidence that our high schoolers were safe and happy at the house, by walking up the beach and having a wonderful dinner at Nantasket Beach Resort Hotel. It was an extra gift to be able to keep up with laundry in the new washer and dryer in the basement. Parking at the house.....on Beach Street?? 3 spaces??? Unbelievable!! We hope to return next summer. Enjoy this little slice of heaven! Very lovely property right on the beach. The house was just as described with a beautiful ocean view. Everything we needed was included and the owner provided info on the area. The charm of the home added to our vacation and we will be returning to this rental in the future. We arrive to moaning wind and pounding surf the Evidence of hurricane Jose. If you don't like the weather in New England wait a minute. Sure enough next day a patch of clear blue showed towards Boston and then we had sun blue sky and surf. Each day was very Dramatic in its own way the water was amazing the house is great. I do my best to work with renters who need to cancel their reservation. Details are in the rental agreement.